In the context of the recent emergence of the Chikungunya virus (CHIKV) in the region, the Medical Scientific Institute anticipated the need for reliable testing capabilities in Suriname, so that any outbreak can be detected as soon as possible. The Chikungunya virus is an RNA virus, transmitted by the Aedes aegypti and Aedes albopictus mosquitoes who are also present in Suriname and also responsible for the spreading of Dengue. The symptoms are sudden fever and severe joint pain. Other common symptoms include headache, muscle aches, fatigue, dizziness and rash. Most patients recover within a week, but in some cases, the joint pain may persist for months and even years. Currently, there is no medication or vaccine to prevent Chikungunya. The disease was described in 1952 in Tanzania and outbreaks occur in Africa and Asia. The first report from Europe dates from 2007 and on December 6 2013, the virus had also surfaced in the Americas. Since then, cases have been reported from various Caribbean islands and recently also from French Guyana and neighboring Guyana. In collaboration with the National Institute for Public Health and Environment (RIVM) of the Netherlands and initiated and supervised by Prof. dr. Malti R. Adhin, the Medical Scientific Institute has set up the Reverse Transcriptase Real Time PCR (RT-PCR) assay for Chikungunya detection. The validation of the test was done on a panel from the RIVM with unknown samples. The agreement with the RIVM for the panel results was 100%, where furthermore in terms of sensitivity the Medical Scientific Institute must prove CHIKV-RNA to the same dilution as the RIVM. This test is available starting May 23 2014, and with that we are able to demonstrate the Chikungunya virus in clinical material from day one of the illness. This test gives the Ministry of Health the opportunity to perform the test themselves during surveillance activities and rapid diagnosis could prove crucial in a possible outbreak, and decisions on measures to prevent the spread. With the introduction of this test the Medical Scientific Institute gives more substance to its scientific and service role in the community and in particular for the health care system in Suriname. 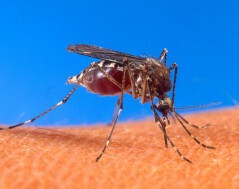 After the first two import cases in Suriname (June 7 and June 19), the Chikungunya virus has also been detected in people with no travel history. The Central Laboratory has per June 26 changed the test algorithm, testing only material from hospitalized suspicious Chikungunya cases. As of September 23, for the Central Laboratory diagnostics is performed for patients with an onset of five days or less. On August 6, in partnership with the PAHO, the Medical Scientific Institute started a daily CHIKV surveillance in a private general practice in Paramaribo, a RGD clinic in Commewijne and on Sundays at the Emergency Room of the Academic Hospital, in order to gain insight into Chikungunya trends Suriname.